Commissioning artwork for the first time: My (amazing) experience! It’s absolutely freezing outside and I have to go grocery shopping. Not too happy about that. But before I go off to do my chores, I want to tell you about my amazing experience commissioning artwork last year! I love art. I really do. I wish I could spend more time at art galleries, I think it would make me very happy. Anyways, one thing I like more than regular art, is custom art. I have been going to my grandmothers house for my entire life and she has had the same art on the walls all these years. It was so crazy visiting her last year after not seeing her in a very long time, but the art on the walls just brought back so many childhood memories I had at her house. I love art because it is something that you can keep forever. You can’t outgrow it, and to me that makes it super valuable. 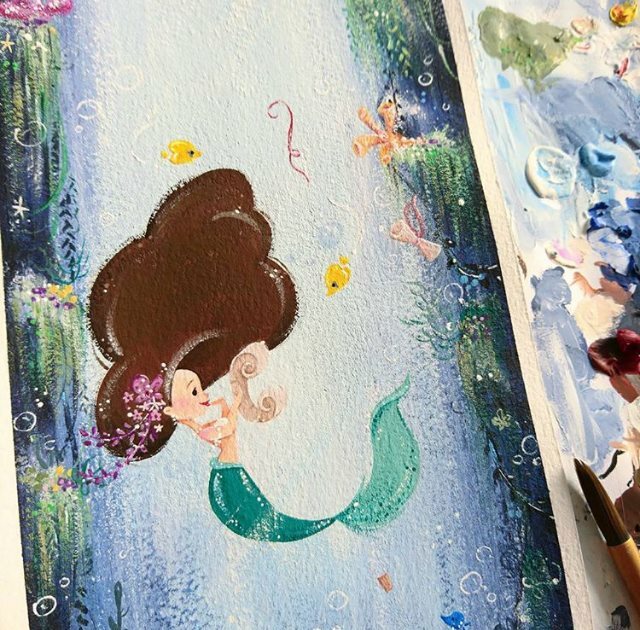 One day on Pinterest (here we go again) I came across this beautiful mermaid illustration. 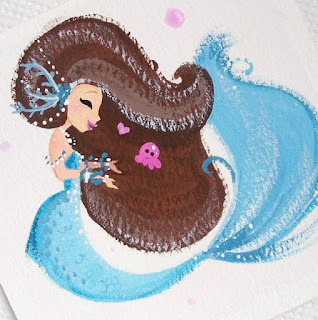 I love mermaids, and this one was very beautifully done. But of course, it didn’t have a source so there was no way to contact the original artist. Some time later, I came across this incredibly talented watercolor artist who did custom watercolor family portraits. They were very cute, but her prices were a bit too high for my liking. Some of the other amazing artists that I discovered did not do any commission work at all, which was a bummer because I loved their work. Finally I found an incredible artist named Michelle. She creates these beautiful cartoon paintings usually of mermaids. And I fell in love! 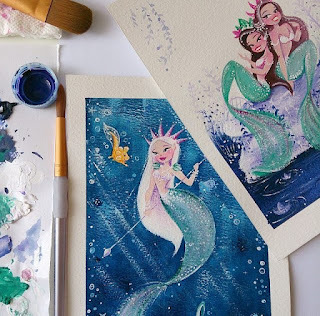 I knew I wanted to get my daughters painted as mermaids! Luckily Michelle does do commission work, so it was a done deal from there. Michelle is an artist based in Poland. 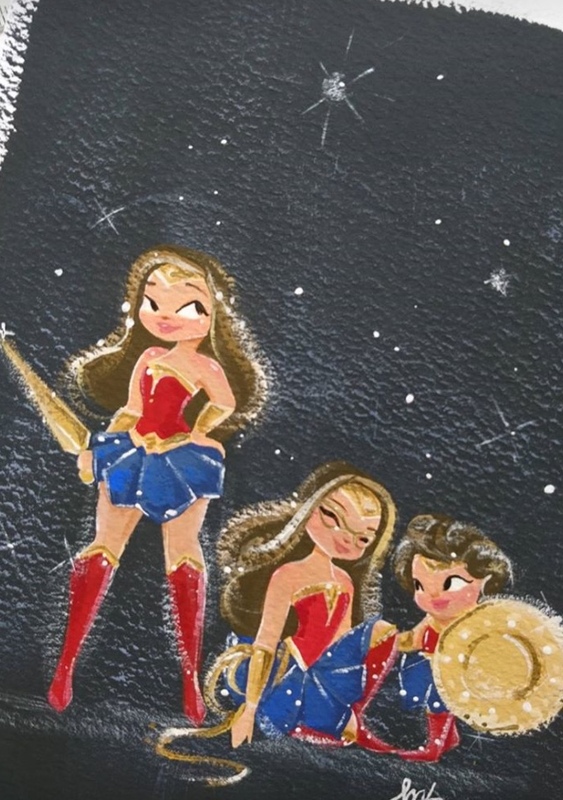 You can find her work on etsy, and all of it is incredible. However, If you reach out to her, she usually takes commission work as well! How awesome, right? I reached out and told her that I was looking for something similar to the mermaid work that she had already done, but I wanted her to paint both of my daughters, and my perfect niece, Alayna. 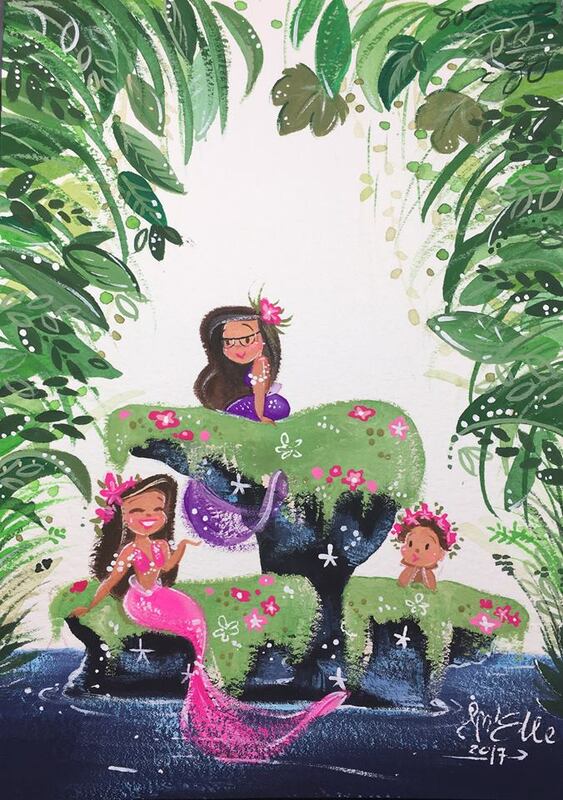 I asked her if I could send her a photo of the girls, she could transform them into adorable mermaid cartoons, and she said absolutely! I had two choices for sizing, one being like a 5 by 7 inches, and the other being 8 by 10 Inches. I chose the smaller one, because they are a little pricey, nothing outrageous, but you guys know that I am very careful with how I spend my money. I figured the smaller size would do just fine. I sent her a photo of the girls, and made sure it was important to her that she gave Alexa, my oldest, her glasses in the final product. I also made sure to let her know what their favorite colors were, (Zoey prefers pink and Alexa prefers purple). A couple of weeks later, I received the draft. It is just a pencil sketch, but it is perfect that way because I was able to make any changes if needed before she added any paint. Of course the draft was perfect and I approved it right away. After another week, it was all done and ready to ship! The small size shipped was about $52.00. Here is the finished product! Shipping from Poland was fast and oh my goodness my girls were in LOVE. It was a surprise for them, so they had no idea. The first thing that I did was go to Costco and make a copy for each of them. They loved it so much that they wanted to take it everywhere, tape it to their walls, they each wanted to hold it, etc. So a copy had to be made. This way, the original can be framed and not messed with, and they get their own copies to do as they wish. They both taped their pictures to the wall by their bed so they could see it when they go to sleep and wake up (awwww). They LOVED it, And I couldn’t be more grateful! Several months later, I was back at it again. After seeing Wonder Woman in theaters (and LOVING it) Of course it was time to have the girls painted as WW. 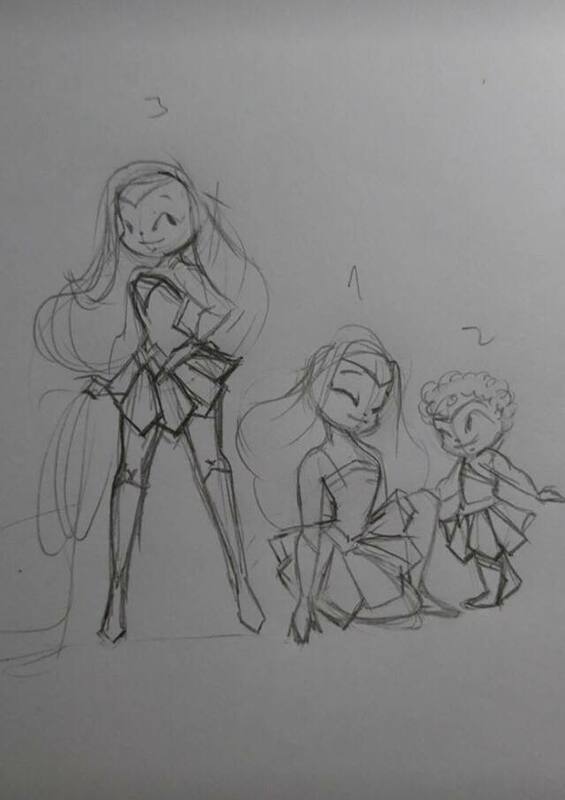 This was fun, because the girls had grown a bit since the Mermaid art (especially baby Alayna) So this one would look different. I sent updated images to Michelle, and told them which of Wonder Woman’s weapons my girls like. Alexa really loves the lasso and Zoey liked the sword. We decided to give Alayna the shield. Preliminary sketches were done in no time and I cant remember but I think we may have made some minor changes to those as well, but otherwise it turned out nicely. Paint was added and before I knew it, the painting was complete and ready to ship! This one cost a bit more because she used more paint to create the dark background. I think maybe $65 shipped? Either way, definitely worth it as the girls absolutely LOVE this one as well. Here is the finished product! 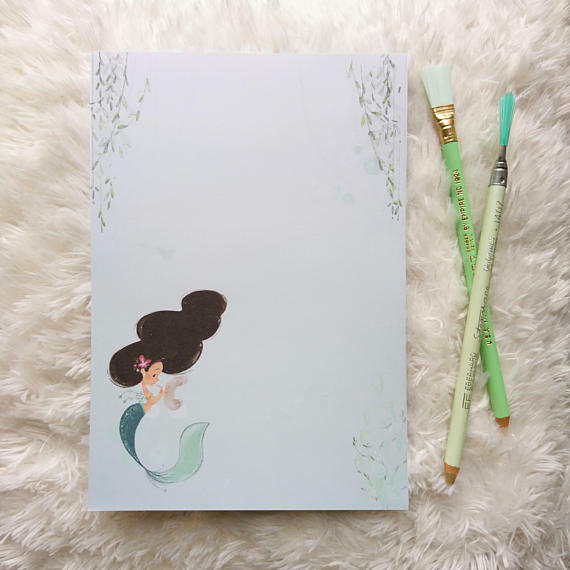 I also have her super adorable mermaid notepad which is perfect for jotting down my grocery list! It's only $10 bucks and such a great gift for mermaid lovers! 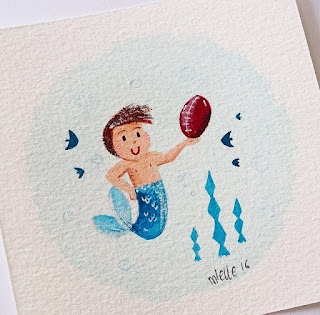 You can follow Michelle on instagram and check her out on Etsy. You won't be disappointed! Here are a couple more of my favorite pieces from her over the years. You can find even more on her etsy shop. Do you love this artwork? Have you commissioned a painting before? Let me know your thoughts in the comments below! I'm always here to chat with you! Have a lovely Sunday!